Spring Collars are the go to for a quick and simple collar solution at a low price. These are strong.. The American Barbell Stainless Steel Gym Bar has a shaft made from stainless steel tested at 190K PS..
5' Olympic Bar, Chrome Hard chrome revolving sleeves with lubrication free bushings. 28mm dia.. The Axle Fat Bar offers a twist on your usual lifting routine, by way of its extra-thick diameter, w..
Take the hassle out of exchanging plates during heavy Olympic lifts! A long handle, rounded feet,.. The American Barbell Proloc Collar is constructed of high-strength, ultra-durable nylon and fit.. 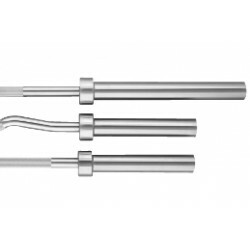 The bar shaft is made from precision straightened stainless steel. The strength of the shaft is.. US Made 5' Bar, Stainless Steel, 110K TS Ground and polished stainless steel. 110k psi tensil.. The American Barbell Camber Bar is a great tool for improving strength, balance and mobility while e..
American Barbell's Stainless Bearing Bar is made from precision straightened stainless steel. The st.. The American Barbell Proloc Strongman Collar is constructed of high-strength, ultra-durable nyl..
Springlock Collar with Grips, Pair .. The Swiss Multi-Grip Bar is excellent for pressing and rowing movements while decreasing the stress .. This is virtually the same barbell as our competition spec. Stainless Bearing Bar just with a bushin..